What do you know about ERP accounting software? There’s a common belief that these are two different systems and they don’t coincide. Accounting software may be a separate project that you use for managing your finances and other things. Or it can be a component of an ERP system that comprises other components that are responsible for other tasks. On this page, you will see who needs such software and for what reason, key components of it and examples of popular projects. Accounting software is responsible for the specific part of the operations in your company. It may include such components as payables, receivables, balance sheets, billings, orders, expenses, and payments. ERP in operations management is something more than a simple application that takes care of financial operations. Accounting is one of the components that make the whole system. 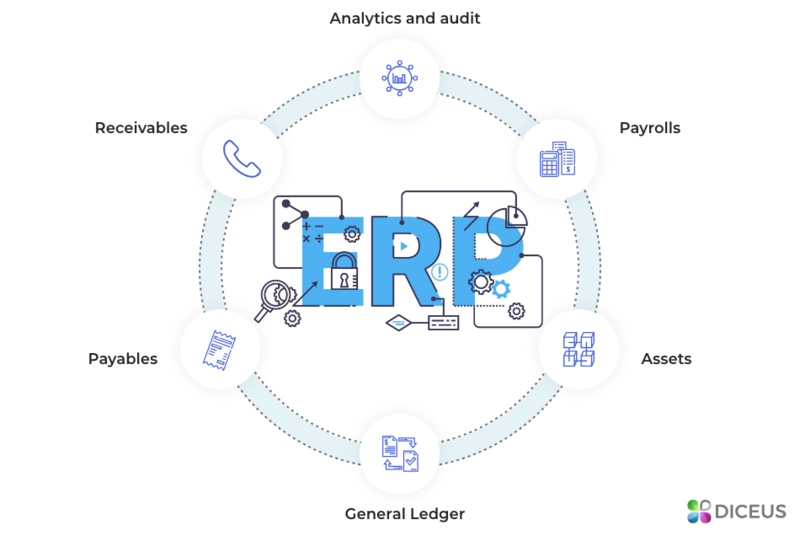 An ERP accounting system is a software solution that is used for monitoring the financial part of the business workflow, tracking assets, resources, and materials. We can also add working hours, performance parameters, production lifecycle or relations with the customers. If you take an off-the-shelf ERP system, you will probably have a component for accounting. If you develop a custom ERP system, you define yourself what kind of accounting module there should be and what kind of functions it should perform. You can have one single module that will make up the whole system for the company if you are happy with the solutions that you use at work. 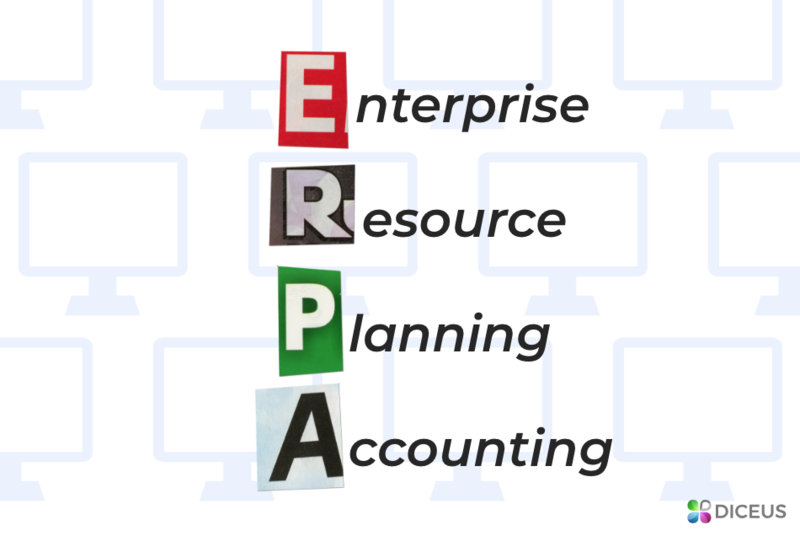 What does ERP stand for in accounting? ERP stands for Enterprise Resource Planning. 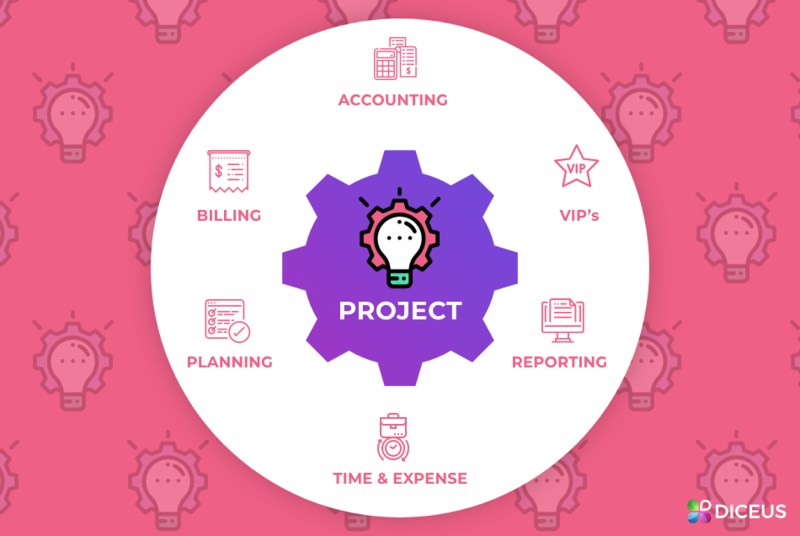 When we talk about accounting, we mean reporting systems (and not all types of ERP systems) that are generated in real time - they all are available at any time of the day or night. You can find out the situation about any operation like inventory or order processing stage. You can also see the resources of the company and track their availability. You can track human resources that are related to the hours of work and other activities of your personnel. You will probably have a few components in an ERP system .You can limit access to each of them. For example, one team will have access to the accounting module while they will not have access to other components. If you have an off-the-shelf solution, you will need to pay either for each new module that you add to the ERP system or for the number of ERP system users that you add to it. In a case of custom ERP accounting software, you pay only for developing the system and its further maintenance if required. There’s a lot of information about ERP accounting software that you can google. You can spend a few weeks reading long articles and get lost in the jungles. 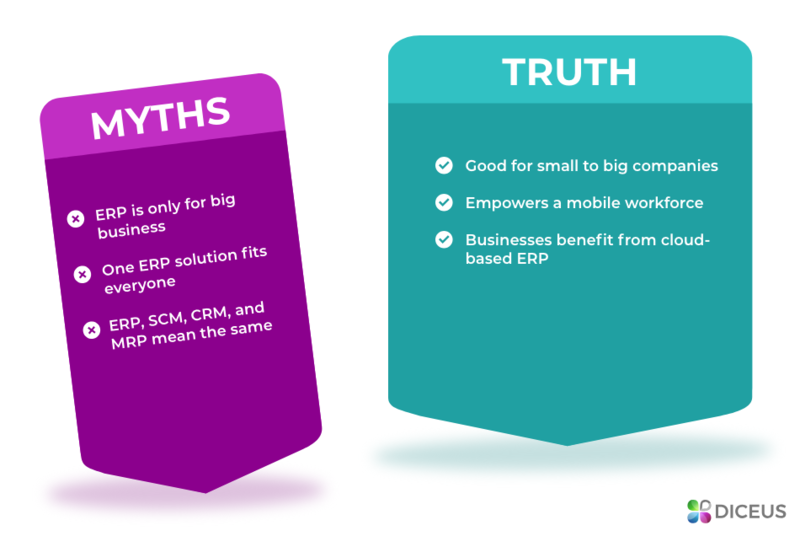 We have discovered the most popular myths about ERP software and we’ll prove to you why you shouldn’t consider them as the truth. ERP is only for big business. If you conduct any financial operations, a robust software solution will automate them and save you from long hours of work and any risks of making a mistake. One ERP solution fits everyone. Each business is unique with its own growth tempo and its own requirements. Available solutions meet the most common needs and they cannot predict your problems, requirements or any other aspects. ERP, SCM, CRM, and MRP mean the same. Letters or abbreviations mean nothing if you don’t go deeper. MRP stands for Material Requirements Planning, SCM stands for Supply Chain Management, and CRM stands for Customer Relationship Management. ERP solutions are used to impress customers. Super fast order and payment processing may impress your clients and they will come back to you again. This is not the key goal but you can do it with little effort. ERP is good only for executives and management of the company. You will save your staff from solving administrative tasks and a lot of daily routines. They will be happy to focus on important tasks that don’t turn into a boring routine. ERP is built for small to big businesses. If you only plan to build a business or you have many years of work behind, you will find ERP software helpful. If you have at least one transaction in a while, you will love the tech solution. Empowers a mobile workforce. You will greatly improve the productivity of your staff’s work. Access to real-time reports and all the data is possible from any mobile device. Businesses benefit from a cloud-based ERP system. You don’t spend anything to get all the hardware into your office and its maintenance. You don’t have to do your best to guarantee that this hardware will work smoothly and you will never have internet connection loss. What are the key components of the software solution and how can you use them for solving your daily tasks? Scroll down to see what you can use ERP accounting software for. It’s good to focus on cash flows and keep an eye on the receivables. You should carefully manage this issue as you will lose the possibility to pay all the bills or even invest money to grow your company. A robust accounting system will show you what clients pay on time and who ignores this. If you don’t have a comprehensive system, you will not be able to track all the payments and if they were made on time. You may send outdated invoices or some clients may forget to pay for the goods or services. You may face problems with solving these problems and it may turn into a real disaster if there’s a big number of clients. A comprehensive ERP accounting software will track all the transactions, purchases, billing, recurring and deferred revenue. You will help your company grow with no pain. Opposite to receivables, payables is all about making payments for the services or goods that your company gets from someone else. If you don’t have a comprehensive ERP application, you may miss the date of the payment or pay twice or even more times. Wasting money and time are the two key things that you have without a proper ERP system. A robust ERP system will track all the invoices and make payments automatically without any delays. You will have access to all suppliers, vendors and any other partners in one place. You will be able to see the history of transactions and analyze the efficiency of the system. This component of an ERP system is responsible for managing all accounts, financial transactions for all the previous and current period, assets, allocations, liabilities and so on. You get a robust component that will provide you with accurate and real-time financial data. You can instantly access the information from any device. You can check information about transactions for each currency you have. You can analyze and compare different financial periods and so on. It’s good to have a reliable ERP app that will prevent any attempts of the third parties to access the data. Everything that your company owns and that has some value is the assets. Here we have receivables, investments, cash, and other tangible things. Thanks to advanced software solutions, you have a great possibility to track the lifecycle of all the assets - from procurement to retirement. You won’t have to manually check everything - you can fully rely on the automated ERP solution. And you can do it on the go with the help of mobile apps. You can limit the access for your staff and they will get opportunities to improve their performance at work. This component is responsible for the salaries of your employees. Some years ago, we had HR, ERP and payroll software were three separate components. A lot of human work was required to handle all the tasks and procedure. A robust payroll app can automate such processes as hiring, retiring, paying salaries, dealing with taxes and other expenses related to each worker. The more people you have in the company the more comprehensive ERP system you will require. Just imagine a company with over 500 workers where there’s always something happening. Some people leave, some are hires, some need vacations or sick leaves and so on. You need a big team of HRs or a single software solution in this case. Having information in front of you is not enough, it’s good to make use of it. If you don’t have a robust app, you will need to hire people that will take all the information, process it and provide you with some analytics or audit. The speed of work may make you favor or play against you. To stay on the edge of the competition, you should get all the analytics and audit in real time. It’s obvious that you cannot expect from people to give you what you want in a matter of seconds. For this, you need good ERP software with accounting module. You will delegate these tasks to the software to deliver insights, reports, forecasts and everything that you need. How to conduct ERP accounting software training for your staff? One of the concerns that a lot of companies face is the need to train the staff. If you are worried about this issue, we’ve got a few tips for you on how to make this process painless. If you have a custom solution, you will not have any extra components - only the ones you need for work. In this case, training will take little time. People don’t really like significant changes, so you should explain why they are so important. It’s good to inform everyone about the future change of the software system in advance. You can describe reasons for merging to a new app, benefits that each person will get and everything that is important for you and the team. People should know how much time they will spend learning something new. You can make a timetable for them and make a schedule for everyone. You may face the need of some workers to have some more time to get to the point while others may need less time. It’s good to have a flexible plan. You have deadlines and you expect people to stick to them. You should check if they manage to do so and find out the reasons if they don’t. You can have a test that will provide you with whether each employee has understood everything and is ready to start work. You may ask your employees to compare the use of a new system to what you had before. We recommend doing this in a few months after you finish the training. You will evaluate the new software and how it simplifies work. Here are a few popular ERP accounting software solutions. It’s a cloud-based solution for financial operations and processes. It solves core tasks and problems to improve the overall business performance and decrease back-office costs. It gives an opportunity to access data in real time. You will find a general ledger transformed into a dynamic asset for better flexibility and ease of use. A bigger part of processes is automated that lets people focus on their major tasks rather than on administrative ones. This solution comprises three components: reporting, inventory, and pricing. It’s not overloaded with a big number of components or functions. If you need a simple but robust variant for your financial department, it may be a good choice for you. It’s lightweight and it doesn’t require long-term training to get started with it. Financial management is one of the components of the ERP system that is built for midsize companies. If you manage a huge enterprise or you have a startup, you will not benefit from it. Developers state that it’s good for retail, government, distribution, manufacturing and other similar industries. You can install it only on devices with Windows OS. Or you will have to pay for the app to be hosted somewhere else. Here you have financial management software that takes care of taxes, payables, costs, forecasts. Developers state that this solution can give you a 360-degree overview of all the factors that influence your financial health. You get all the data in real time. It manages the presence of the money to pay for the raw materials, evaluates the accuracy of quotes and prices, controls everyday transactions and much more. It’s a cloud-based solution that helps you simplify the processes and operations. This software is used in the manufacturing and wholesale distribution sectors. You have general ledger, budgeting and cost accounting in this product. There’s no single huge system for all the niches, so you may navigate through their site to see what you can get for your company. Diceus doesn’t offer off-the-shelf solutions. You can order a custom ERP accounting app that will help you solve your business needs. This will include all the functions that you need even if they go beyond a standard list that you have in other applications. The only thing you should mind is time. You will need to wait for a few weeks or months before you can start using the software. Here at Diceus, we deliver robust and comprehensive solutions for any-sized business. We have a solid experience, a positive reputation and a team of certified developers. If you want to get reliable and lightweight software for your financial department, let us know -about it and we will assist you with this.